I see Scare Glow is still getting work. The first original story for the comics. 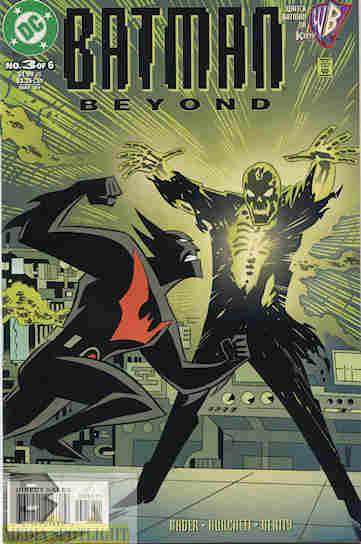 Blight (Derek Powers’ radioactive alter ego) is after a series of manmade elements that, when combined, can drain radiation. Since nuclear power is a big thing in the future that’s bad news. Going after the final element by using tunnels only Bruce knows about, Batman finds a group of homeless kids and their caretakers, who believe the system won’t help them due to problems they each have versus the “perfect” society of future Gotham. They show him a short cut and Batman manages to defeat Blight while Terry also leaves some gifts for the kids. What they got right: Terry shows he’s a worthy hero in this story. He rescues people, and shows compassion to the underground dwellers, even finding a puppy for one kid while leaving them toys and most importantly something to eat. It shows at least someone cares about them, and I like that. What they got wrong: Was Powers hoping to cure his condition with the combined elements? He doesn’t state so and I’m only inferring from when Bruce suggests the potential uses of the three combined elements. And this story is rather negative towards systems in place to help these kids. I’m not sure that’s a good message to send. Sure, you hear horror stories, but that’s because the news only covers when things go wrong that usually go right. They also don’t contribute a whole lot to the story. Recommendation: For the first original tie-in comic story it’s not too bad. Blight was Terry’s first arch-enemy and since he was introduced at the end of the last issue it makes sense for him to show up here. (Terry’s Batman would first meet Blight I think during the Mr. Freeze story.) It’s worth checking out. Posted by ShadowWing Tronix on May 12, 2018 in Animation Spotlight, DC Spotlight, Television Spotlight, Yesterday's Comics and tagged Batman, Blight (Batman Beyond), DC animated universe, DC Comics, DCAU, Derek Powers, Terry McGinnis.